As the Ford Explorer continued its journey north from Mission Beach on Interstate 5 (the San Diego Freeway) – a route that takes a nice path close to the Pacific Ocean starting around La Jolla. A few glimpses towards the west the beautiful blue Pacific can be seen at times at higher elevations. Not having satellite radio in the Explorer and not wanting to listen to commercial filled FM band, I chose instead to just take in the sights and listen to the harmonic hum of the 4.0 V6 which seemed content at highway speeds. Even with no tunes or distractions, the drive time went by fast. The Explorer was soon rolling by Camp Pendleton which was where Surfer Joe ended up in the 1963 cult classic Surfaris’ song by the same name. After Camp Pendleton, there’s Orange County which is the county south of Los Angeles County. Orange County may be known these days as the home of the self centered plastic surgery loving housewives that are seen on the popular TV show – The Real Housewives of Orange County, however it once was a bastion of orange groves hence its name. The southern gateway to Orange County is San Clemente a beautiful seaside community that was started by Ole Hanson back in 1925. Hanson setup San Clemente as a tribute to Spanish architecture – he was responsible for the strict building codes which for many years mandated all buildings in San Clemente have red tile roofs. Even though these codes have long been lifted the city which has grown to around 66,000 still has a strong Spanish flair. San Clemente was also home to Richard Nixon from 1968 to 1980 when he owned a palatial estate that overlooked the Pacific Ocean which he called “La Casa Pacifica”. His home during his Presidency hosted many meetings with foreign leaders and dignitaries. In Ron Howard’s recent movie Frost/Nixon, some of the scenes were filmed here at Nixon’s former estate. Up the road is San Juan Capistrano which was originally founded by Father Junipero Serra in 1776, this is where Instate 5 takes a strong turn inland and soon thereafter is where Route 73 begins – a route that runs through the San Joaquin Hills. It was driving through these hills that the Explorer really felt taxed; like a two-pack-a-day cigarette smoking old man running a marathon. And the steep grade up to where the main toll plaza for Route 73 resided was where I was wishing that I had opted instead for a V8 powered Explorer for this trip. Fortunately the route was only 15 miles and soon intersected with Interstate 405 where the Explorer could return to more flat terrain. The 405 is a continuation of the San Diego Freeway (Interstate 5) which the Explorer had been on earlier – where Interstate 5 intersects the 405 in Irvine the 405 becomes the San Diego Freeway. Route 73 basically is a cutover route which shaves off a few miles by not taking the 5 to the 405. On the 405 the Explorer continued through western Orange County and soon hit the Long Beach area where a quick turn on to southbound Interstate 710 (the Long Beach Freeway) brought the Explorer past downtown Long Beach, Port of Long Beach, and Port of Los Angeles. It was right near the Port of Long Beach (in Long Beach Harbor) in 1947 where Howard Hughes made his world famous test flight of his gigantic H-4 Hercules airplane more commonly known as the Spruce Goose. Interstate 710 crosses from Long Beach to Terminal Island via the Gerald Desmond Bridge – a large arch bridge – it’s on Terminal Island where the 710 official ends and then becomes Route 47. Soon Route 47 Exits Terminal Island by crossing over the Vincent Thomas Bridge which is the third largest suspension bridge in California – this was where the Ford Explorer was again taxed going up the steep incline to get to the apex of the bridge. In the original Gone in 60 Seconds movie, H.B. Halicki led a high speed chase with a 1973 Ford Mustang Mach-1 across the Gerald Desmond Bridge and the Vincent Thomas Bridge. He made it seem easy with the 351 Cleveland (V8) powered Mustang, with the Ford Explorer I was wishing I had a little of that 351 Cleveland power under the hood. Nicholas Cage in the remake – Gone in Sixty Seconds only went over the Vincent Thomas Bridge however he did it in style with one very dazzling car jump over stopped traffic in a modified 1967 Ford Shelby Mustang GT500. Cage’s Mustang was packing 428 cubic inches of V8 power under the hood. The Vincent Thomas Bridge which first opened in 1963 spans across Los Angeles Harbor which is located on San Pedro Bay. San Pedro Bay is part of San Pedro, a port district of the city of Los Angeles. San Pedro has its roots as a fishing village. A quick stop at the Ports O’Call Village which consists of quaint shops and the Ports O’Call Restaurant which has a great view of the Los Angeles Harbor area, is a local favorite. Cabrillo Beach in San Pedro and its picturesque shoreline is a favorite among families and surfers who have plenty to rave about the great surf that beats upon the shore. San Pedro has many older homes; it’s a community that has not changed much in the last 40 years. There are a good number of homes closer to the shoreline that date back before World War I.
Fort McArthur in San Pedro was once a military fort that guarded the coastline against an enemy naval attack. The Army Fort which was established in 1888 was named in 1914 after Lt. General Arthur MacArthur the father of General Douglas McArthur. The main base area of Fort McArthur which since 1982 has served as an administrative outpost for the Los Angeles Air Force Base, has not changed in years – its buildings still have the same red tile roofs and Spanish influenced architecture. The base compound is so neatly manicured it looks more like a five star hotel resort than a military base. The lower portion of the base (closest to sea level) is long gone, it is now Cabrillo Marina. The upper portion (way up the hill) is now Angels Gate Park which is owned by the city of Los Angeles. 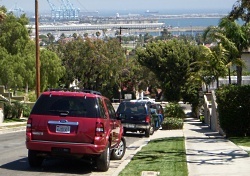 It’s the trip up to this park where yet again the Explorer was a huffin-and-puffin – San Pedro was built on a steep hill which has the added advantage of allowing many of the residents from their homes a view of the Pacific Ocean, Los Angeles Harbor, and Long Beach Harbor. The downside is driving up these steep hills and when parking – you better turn those wheels toward the curb (if the emergency brake ever gives out on one of these hilly streets expect a land speed record by the time the vehicle gets to the bottom of the hill). However the drive up the hill to Angels Gate Park was worth it. 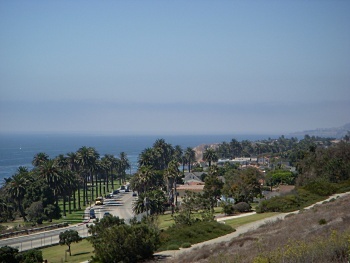 The park has an awesome view of the Pacific Ocean which even includes a view of Catalina Island on a clear day. Another site worth visiting in San Pedro is the Lighthouse Deli which is a local favorite with a diverse menu that offers plenty of choices for even the most finicky of eaters. The breakfast and brunch choices are what the locals rave about. After San Pedro, the Explorer then found its way up the winding coast on Palos Verdes Drive. This drive is truly breathtaking – with a view of the Pacific Ocean to the left. This road runs right through posh Rancho Palos Verdes. First notable site in Rancho Palos Verdes is the opulent Trump National Golf Club Los Angeles which overlooks the Pacific. Rancho Palos Verdes is located on the Palos Verdes Peninsula which is a large land mass that juts out into the Pacific. Portuguese Bend in Rancho Palos Verdes is a small land mass along the Pacific where the land is pristine and untouched and offers a magnificent view. On this particular day I witnessed a large blue whale swimming near the bend – the numerous blue whale sightings the previous weeks (before my arrival) had been the talk of the area. After the bend and right up the hill, is the world famous Wayfarers Chapel – a glass chapel that was designed by Lloyd Wright (son of Frank Lloyd Wright). The chapel is nestled in a woodsy setting up on a hill with views of the Pacific. Many celebrities have been married at the chapel over the years – one of the most famous was the ceremonial union of Jayne Mansfield and Mickey Hargitay in 1958. Just north of Rancho Palos Verdes is Palos Verdes which is where the movie Life as a House was filmed. The movie centers around a man with terminal cancer (played by Kevin Kline) who tears down his old family home on a cliff in Palos Verdes (overlooking the Pacific) and builds his dream home on the same site while trying to repair his relationship with his estranged family. The finished home, as shown in the movie, is typical of the beautiful homes on the edge of the cliffs of Palos Verdes overlooking the Pacific. There are also many homes up the hill which also share the same view at a higher attitude. 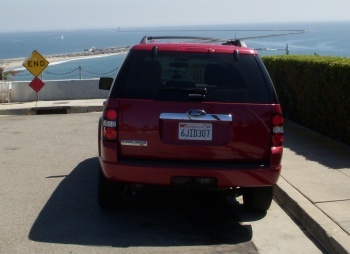 The Ford Explorer seemed very comfortable on the winding roads through Rancho Palos Verdes and Palos Verdes. It was a peaceful jaunt through driving nirvana. As the Explorer hooked up with Route 1 – the Pacific Coast Highway in Torrance, I found myself already missing the seemly untouched Palos Verdes Peninsula. The sprawl which Los Angeles area is well known for commenced again with Torrance. Continuing on Route 1 led the Explorer through Redondo Beach, Hermosa Beach, and Manhattan Beach. And then it was through El Segundo right before Route 1 intersected Los Angeles International Airport or LAX as most call it. On the other side of LAX on Route 1 is Marina Del Ray. Next to Marina Del Ray is Venice which is part of the city of Los Angeles. Venice needs no introduction it’s a community that was founded by Abbott Kinney who had made his fortune with tobacco. His vision was to make Venice into a cultural center which would rival Venice, Italy the city it was named after. Kinney went even so far as to build canals to mimic those of Venice, Italy. Also part of Kinney’s vision was Venice having the best amusement attractions money could buy. Venice Beach would soon thereafter be called the Cooney Island of the West Coast due to all the many amusement parks and attractions in the area. The amusement parks eventually closed down but the canals still remain. 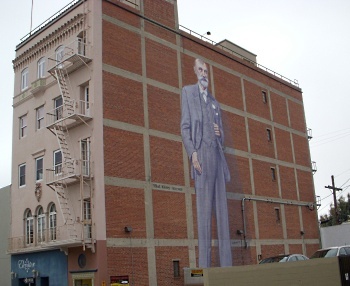 Albert Kinney’s memory also remains – a large mural of him is painted on the side of a building only about a block away from Venice Beach. At Venice Beach there’s a large boardwalk area with what has to be the most diverse array of shops, stores, and eateries on the planet. Venice is well known as a haven for eccentrics who congregate and intermingle in symbiotic harmony. So it’s no surprise that modern bodybuilding has its roots here. Back in the 1930s Muscle Beach was designated to a small portion of beach property in Santa Monica just north of Venice Beach. This is where Jack LaLanne and some of the other early California bodybuilders would come to weight train and demonstrate to the gathered crowds amazing feats of strength. In 1952 Muscle Beach officially moved into the heart of Venice Beach where it remains to this day. It was bodybuilders like Arnold Schwarzenegger and Dave Draper who made Muscle Beach world famous by the 1970s. The main outdoor weight facility may have been updated in 1992 but the same clanging of iron can still be heard today as bodybuilders perform their ritual of lifting heavy weights in the open sea air with the Pacific Ocean within a stone’s throw. Unfortunately by the time I reached Venice the beautiful weather I encountered during the entire adventure had disappeared. In Venice it was unseasonable cold and overcast with no sign of the sun. After spending some time on the Venice Beach boardwalk I walked back to the Explorer which was about eight long blocks from the beach in a pay parking lot. This parking lot like many in Southern California have the rent-a-car lot parking spikes – one wrong turn and you’ll find yourself with two or four flat tires depending on how fast you make your mistake. It’s little annoying nuances like this that make you thankful you don’t live in California. Where I am from on the East Coast, parking spikes are a very rare encounter (and I mean extremely rare). A quick drive up the road to Santa Monica, I stopped at a beach parking lot and no surprise – there were parking lot spikes. This stop was the spot where the once formidable Pacific Ocean Park or as the locals used to call it “POP” (pronounced pee-ooh-pee) once resided – a 28 acre amusement park situated on one very big pier. The park first opened in 1958 and rivaled Disney Land; however this success was short lived nine years later the park would permanently close its doors leaving one heck of a mess behind. It was this mess that became in the 1970s the epicenter of a surfing and skateboard movement that would influence both sports but would revolutionize skateboarding as seen in Stacy Peralta’s documentary Dogtown and Z-Boys. This area around the wreckage of POP would be called Dogtown during the 1970s. Now there is no sign of POP, all remnants have been long since removed. It’s now an upscale beach area with only high-priced condos and housing in the vicinity and it looks no different than the familiar beach scenes on the TV show Baywatch (many of which were filmed on the beach in Santa Monica). And a short drive up to the Santa Monica Pier where Pacific Park resides. 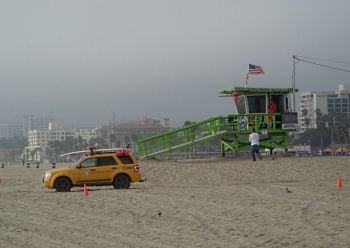 Pacific Park (not to be confused with POP) is the last amusement park in existence in the Santa Monica/Venice Beach area – it is a very popular tourist attraction. Walking out onto the pier is a step back in time with all the small shops and eateries which lead into Pacific Park which is situated on the pier over the Pacific Ocean. Just about everything you would expect from an amusement park is here – like a roller coaster and a ferris wheel. However you don’t get the full effect unless you walk down the Santa Monica Pier at night, the dazzling array of lights including those on all the amusement park rides will have you grinning ear-to-ear like a little kid on Christmas. Soon it was time to wrap up my trip and after a big dinner in the downtown section of Santa Monica, I drove away from Santa Monica in the Explorer. It was not too long after that I was turning in the Explorer. The steep hill and bridge inclines encountered during this trip had me wishing and longing for a V8, but by the trip’s end I was surprised at how well a vehicle the size of the (V6 equipped) Explorer, sipped the gas. A V8 would have sucked down the gas a lot faster. When I turned the keys of the Explorer over, the thought occurred to me that this may be the last truck based Explorer I will ever drive and if that is the case it will be a trip I will always fondly remember. Indeed this Explorer crusade was a fitting retirement for the truck based Explorer that served me so well just like the many hordes of Explorer owners over the last 20 years.